When building a new home its important that you select a builder that best suits your needs. Here are some of our faq and answers that will help you prior to starting the process with a builder such as Renmark Homes. What is the difference between Renmark Homes and other builders? Renmark Homes is a family business which is a huge advantage to anyone looking to build a home of their own. It is run by its owners and we take pride in building new homes that reflect the quality and attention to detail that is often lacking in mass produced homes, townhouses and apartments. Our service is best suited to people who have built before and require a hands-on involvement in their project. We do not offer unrealistic ‘from’ prices just to generate an enquiry. Although we can provide an inclusions list, generally our clients tell us what they require in their new home and we include that in the pricing. Our prices include a finished home, with service connections to a 700m2 block, H Class soil classification and 2700h ceilings as standard. Volume builders and many other similar builders tend to sell their ranges from display homes, where the customer can pick from set styles and then package up options to get a particular model on their block with the inclusions they wish for. Renmark Homes tend to build homes that the volume builders can’t build or do not wish to build due to the degree of difficulty or customisation. We are large enough to cater for all types of housing, whether it’s your design or ours, whilst maintaining a personal and professional service found with smaller companies. You deal direct with the owners of the company from concept to completion. When building a new home there will be costs associated with getting your block prepared for construction. These are referred to as site costs. Generally the more difficult the block the higher the site cost will be. Some examples of site costs would be excavation, demolition or tree removal and retaining walls. If a block is unserviced or requires new services these costs would form part of the site costs. On new homes in new sub divisions we include site costs. If you are looking at a knock down and rebuild, we include the majority of site costs. However council may require the installation of new services which is the owner’s responsibilty, not that or Renmark Homes. An example of this would be under ground power or a new water tapping because the original no longer complies. Power, water, gas etc are services. New estates have all services brought to the boundary of your block. However if you are considering a knock down and rebuild home, additional services may be required or existing services may require upgrading. These can add costs to your building budget. Renmark Homes prices include connections to existing services. What is meant by the fall of the land when building? The fall of the land is basically the steepness of the block. Your block may be classified as either flat, moderately steep or steep. When building, moderate and steep blocks are often classified as difficult sites. Flat blocks tend to be cheaper to build on due to little or no site costs. How will the fall of my block affect the cost of my home? Flat blocks are usually built on a slab foundation. This is considered the simplest, quickest and most economical form of building. As the block becomes steeper additional work is required to get it prepared for construction. Preparation often involves excavation and depending on the degree of difficulty, retaining walls and in some cases a basement. Once the fall of the land exceeds a certain steepness a slab cannot be used and more traditional methods of construction are required which by nature are slower and require a greater investment. As a rule of thumb the steeper the block the higher the cost will be for the build. Other things to consider with steep blocks are site access for deliveries and issues with the height of your home. There are no prices on your home designs, why is that? Generally the plans and styles shown in our range are used as a starting point to give our clients some ideas on size and shape. We do not have a price list because we individually design beautiful homes for each client, taking into account their needs and their budget. We can provide price guides on all our plans upon request to assist with a feasibility on a site you want to purchase or a home you’d like to build. There are 4 things that affect the cost of a home. Only after considering all these factors can some site specific price guides be given. A contemporary look in its most simple form means a modern look reflective of today’s architecture. Put simply anything that reflects a heritage influence, such as Victorian or Federation, is not contemporary. Many new estates have guidelines or controls that prevent building period style homes. Always familiarise yourself with the controls for an estate prior to purchase to ensure what you like in a home can be built. Is it possible to build an environmentally friendly home. Renmark Homes were among the first builders to be accredited under the MBA Green Living Program. As a Green Living Builder we are committed to building and designing homes that produce less green house gas, use less water and power, and are healthier to live in. Our commitment to this philosophy has seen a dramatic shift in the type of products now used in homes, reduction in waste and greater use of recycled materials. The goal being a home that looks good, feels good and has minimised the negative impact on the environment. Where possible, Renmark Homes uses environmentally friendly concrete and plantation timber on its homes as standard and is continually looking to partner with suppliers that share the same philosophy. We can offer advice and solutions in making your home greener without blowing your budget. Do you have a list of Standard Inclusions when building a home? A standard inclusion list is a listing that details what goes into a builders buid price as an absolute minimum. This is generally used as a starting point for preliminary estimates and a good way of comapring what builders include in their prices. Click here to down load our standard inclusions list.specification. If you have your own design and want a quote we recommend writing up a “wish list” to submit with your plans. A detailed inclusions list can be downloaded by clicking here. We will provide an all-inclusive estimate for the construction of your home based on the wish list. Should the estimate exceed expectations we can easily make recommendations on the inclusions to meet your budget. Yes it is. In fact, we discourage rubber stamping of existing designs onto your building site. All our plans are customised to meet the needs and budget of clients just like you and take full advantage of the site. If however there is a plan or elevation that really appeals to you we are more than happy to modify it to suit. Alternately, you can use any of our plans as a starting point on achieving your ultimate design. We can offer different options for the external appearance of a particular floor plan, by changing the roof shape, colours, materials etc. Will you design for, or build on difficult blocks? Yes, whether it is steep or has a gentle slope we can design a home to suit. In fact, we are known as experts at building on difficult blocks. Ask us to see examples of how we have done this for our clients. Building on sloping blocks usually costs more to prepare the site and in the method of construction. The end result can be stunning individual homes with versatile floor plans that are not possible on flat blocks. Do you design for narrow blocks? 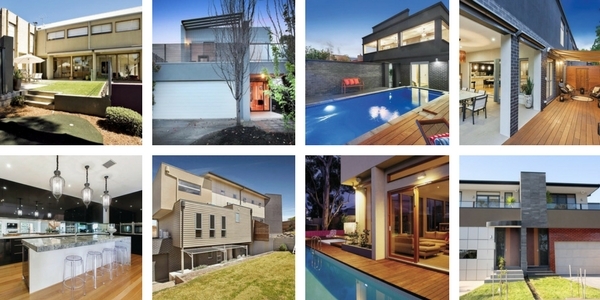 With land prices on the increase in Melbourne many estates now offer smart blocks as an economical alternative. Smart blocks are usually very narrow and have a zero allotment on one side. We have a great deal of experience in this type of home and can easily adapt the many designs we have to suit an inner suburban site or a smart block site in a new estate. We have designs that range from 7.5 metres wide to 12meters wide. Generally our prices are for a completed home and do not include landscape works. If however difficult landscaping and fencing is required we can include it in our estimate. What type of contract do you offer? Renmark Homes is a member of the Master Builders Association (MBA) and the Housing Industry Association (HIA). These organisations offer plain English housing contracts that comply with laws governing building a home in Victoria. We use an MBA fixed price contract for all our clients and this works very well for all parties involved. Providing a building permit has been issued we will generally be on site within 4-8 weeks of signing the contract. How long will it take to build a home? Generally the construction period is approximately 9 months for a standard double storey home of approximate size of 250m2. The complexity, size and inclusions of the home can affect the length of the construction period. The term in the building contract takes into consideration the specific requirements of your home and site. For difficult sites the construction period can take 12 - 15 months. What construction guarantees do you offer? We are legally obliged to provide each contract with a Warranty Insurance Certificate. This certificate is insurance on the building which provides structural protection for 6 ½ years from the date a certificate of occupancy is issued. Further there is a 90 day maintenance period whereby we come and fix any minor issues with the home once you move in. Can we visit the building site to see our home? Yes you can. Access is by appointment and usually during normal working hours. For any further questions or to talk to us about your ideal home, contact us here.